The Aussie was the biggest gainer and the yen was the main loser against the greenback yesterday, as the financial community continued to shrug off the latest escalation in the US-China trade saga. As for today, pound traders are likely to focus on the UK CPIs for August, but most importantly on the informal EU summit in Austria, where Brexit is expected to take center stage. The dollar traded mixed against the other G10 currencies on Tuesday. 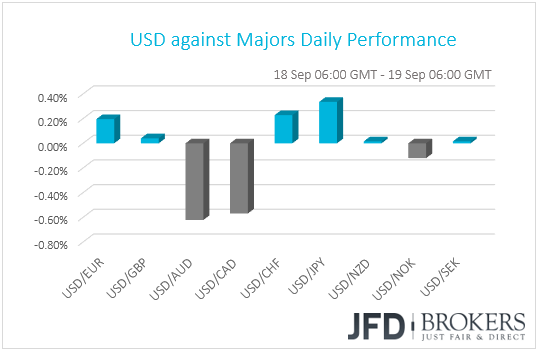 It gained against JPY, CHF and EUR in that order, while it underperformed versus AUD, CAD and NOK. The greenback traded virtually unchanged against GBP, NZD and SEK. Read the full financial markets daily report on JFD Research.